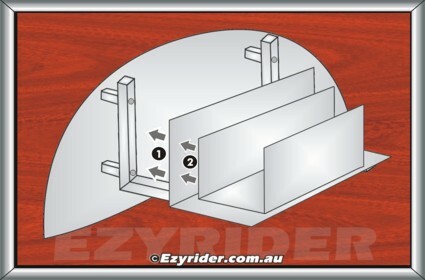 ﻿ Motorcycle Modifications 1985 Vintage - Information & Pictures. Over 15 years ago I was looking for a bike that didn't cost a lot and could be modified to suit the ride I wanted. I wasn't interest in a name/breed of bike. It was all about riding, not brands or breeds. And the riding needed to be comfortable and suit the need and style of the rider. One of my main considerations was the seating position: low to the ground. That is, when the bike was stationery my feet needed to be comfortably flat on the ground with legs slightly bent. After seaching ads and styles of bikes I found the style and suitable bike, that was up for sale out west and is now 30 + years old. Over the phone he said the motor was good, low klms, a bit damaged, unregistered and couldn't start it 'cause the battery was flat. I took the chance, travelled out west, and loaded the bike in the van. Plus an extra tank, helmet, parts, service manual and specification book. He was right. The motor was in good shape and it now has over 1000,000 klms on the clock. It has been my preferred & continual mode of transport. First was to get it roadworthy and registered. Generally it was all A-OK. The next step was working out what to do and the rear end was the first area that needed improving. 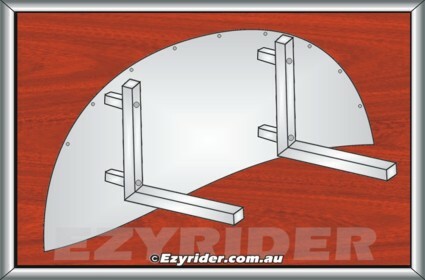 The sissy bar was too small, the rear guard needed to wrap around the rear wheel to enable a plate fitting to each side of the rear guard for a saddle bag frame attachment. The passenger seat was uncomfortable and too small, so bought one from the wreckers and reversed it on the bike so the passenger, or any load, didn't slide off the front. Then came handle bar replacement: they needed to be slighly higher. 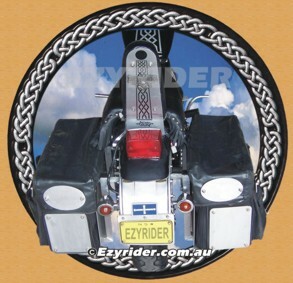 Then blinker lights, highway pegs, tank graphics and a more comfortable re-upholstered rider seat. The main aim was to provide a more comfortable ride with storage. I researched a number of saddle bag varieties but they were either too small or too expensive for what I wanted. So I had to come up with an idea of how to? To attach an aluminium plate around the rear guard seemed the first solution, as it also fitted in with my idea of extending the rear guard around the wheel. Found some bags in a luggage bag store for $30 each and cut off the carry straps and handle. To make them water proof on the top sides I cut a cardboard template up around the bag, taped it together and took it down to the local upholsterer and he made them up for $25 each. So I had the saddle bags I wanted. Next the attachment. The backing aluminium plate is attached to the rear guard. Made a cardboard template first and then cut out the aluminium plate. Select a thicker plate for strength and cutable with a jig saw. The bottom area was cut into a shape rather than it being straight. The plate was attached to the guards with cut to size threaded rod and stainless hex dome nuts on the outside. The brackets are aluminium SHS. I measured the size wanted and took the plan to the local steel fabricator. The spaces on the brackets are hollow ........ and large bolts were used to bolt through brackets/plate. The spaces were needed to bring the brackets out from the frame so they didn't knock against the frame/axle while moving vertically with the rear springs. The next step was to bend at right angle a suitable sized piece of aluminium (1) - to fit the bag size. It was just bent around a piece of wood. Then bolted on the SHS brackets. The U shaped aluminium plate fits inside the bag, the size of the interior. This is needed for 2 reasons: It attaches the bag to the side and bottom plate (bolted through the inside of the bag) and it also gives the bag internal strength reducing damage over time. I cut a piece of car carpet to sit on the floor. (1) Shows the front side SHS and (2) the rear SHS. The plate rests up against the spring suspenstion but hasn't been a problem. (D) Is the spacer while (3) is the bottom plate attached to the SHS. 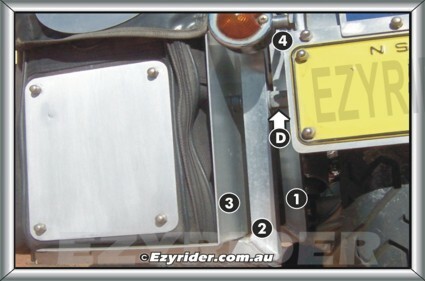 (4) shows the new rear blinker attached to the alloy plate attached to the guard. The rear plate on the bag is just for cosmetic purposes, yet helps with rear visability, and, does also keep the bag 'open'. (M) Shows the hex round head nuts used to bolt the plate onto the inner brackets that also serve to hold the guard extension. (N) Is another aluminium plate cut to size and bent around to fit. (O) Is another piece that was cut to size to fit under the old guard and fill the gap. A couple of stripes of car dec. strips were applied to the edges (to the right of (N). (Q) Is the vinyl cover for the bags. A thicker plate was cut to house the number plate and the flag. 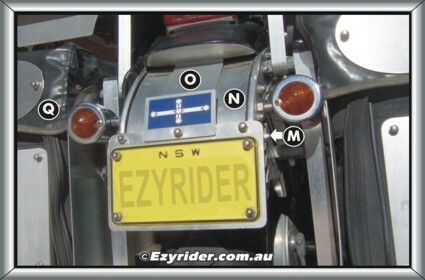 The side plate also came in handy to attach the new rear blinkers. 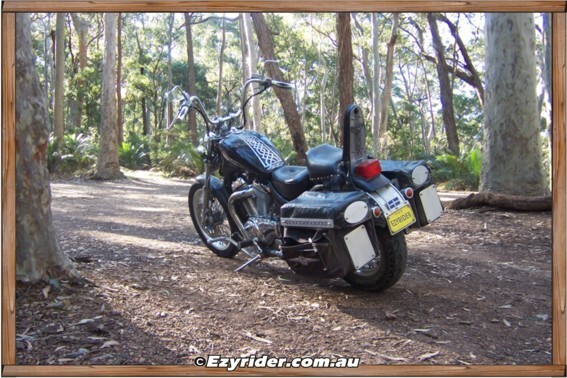 The sissy bar was done in a similar fashion. Cardboard template first, with a plan, local fabricator bent and made it out of SHS. The local upholsterer made the front vinyl cover, I filled it with foam, cut the rear plate, tucked in the vinyl, and bolted it to the flat metal inside the exterior SHS frame. The graphics are self adhesive + a belt buckle. 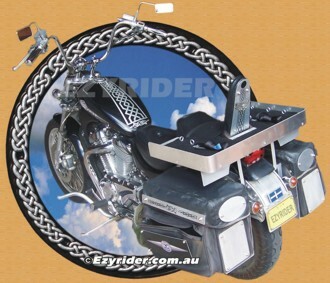 It was attached to the same assembly as the original sissy bar. In the end it all fits within the rear end of the bike itself as a complete unit, and serves the purposes all were designed for at minimal cost. 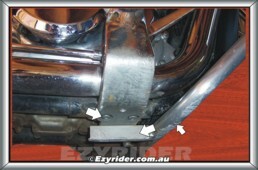 For more rideable comfort the manufacture of a cruiser/highway bar was necessary, and located to the front of the original foot pegs. Made from 25mm RHS solid aluminium and bolted to the original peg structure, through 2 alloy angle pieces welded to the RHS. To first make it fit, a solid piece of wire rod was bent to a shape and positioned (taped/bracket) so gears could be changed with a heel movement. The ends were capped with a gal cap and sprayed silver. Other changes: Higher rise handle bars, lowered stream lined rectangular mirrors, two tone graphic grips, front blinkers same as rear, a larger rear seat (reversed) with a front riser, and tank graphic designs. When all done it ended up what I wanted in a ride and that is really what it is all about .... your own ride.